Are you a woman motorcyclist who loves skulls as well as purses with concealed carry capabilities? Ladies Conceal and carry skull purses and handbags for bikers might just fit the order for your newest handbag. 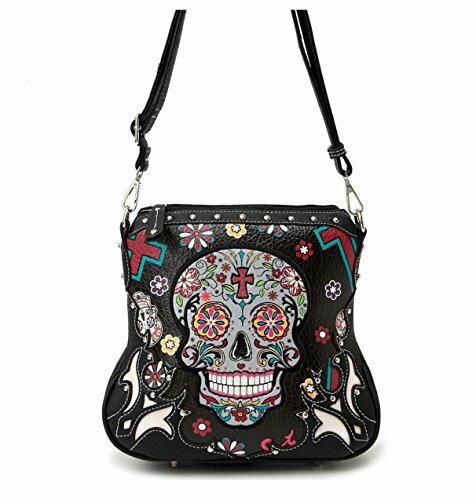 Stylish and sassy, these are cool women's purses will be the envy of all your skull lovin' biker girl friends. And the concealed carry feature is an added bonus. Personal safety for a modern day woman is paramount, whether or not you are on your motorcycle. Concealed carry gun purses have room to store the hand gun of any pistol packing mama. If you live in a state or country where carrying firearms is a no-no, you can use the extra space for all of those important items to carry in your motorcycle purse. Skulls have long been a staple in motorcycle culture, but in the past few years they have gained popularity in the mainstream population. Here are two interesting skull logos that are popular. The history of the Harley Davidson "Willie G" skull is clouded in uncertainty. The generally accepted story is that in the 1930s, bikers became associated with being criminal outlaws when they started using skull accessories. Designer Willie G Davidson developed the logo to lessen the negative connotations of skulls in motorcycle culture. Colorful, imaginatively decorated Sugar Skulls originate from Day of the Dead (Dia de los Muertos) celebrations in Mexico. The gorgeous candy skulls are traditionally made of clay molded sugar and brightly decorated. The festooned sugar skulls are then put on gravestones or altars of relatives or loved ones. They are beautiful. Cross body purses are more secure to carry than normal handbags. They go over your shoulder and drape across the body to rest on the opposite hip. This gives you hands free operations and the purse will not slide off your shoulder at inopportune moments. 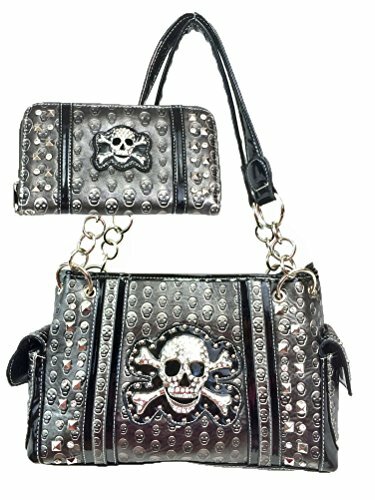 This rhinestone skull purse is made of black vinyl and decorated with metallic rainbow thread and chrome rivets. The chrome colored skull is decorated with gleaming rhinestones. Adjustable straps make sure the fit to your body is perfect. There is a zippered top and storage compartments inside and outside of this 10.75 inch deep by 9.5 inch long by 1.5 inch deep bag. The zipped conceal and carry area is on the back of the purse. 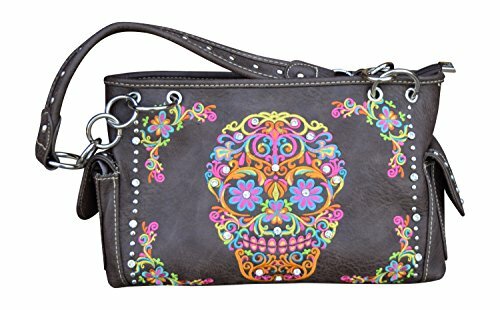 There are such incredible colors in this crossbody sugar skull conceal and carry purse for bikers. Flowers, skulls and crosses decorate this practical handbag! This beauty of a faux leather purse is certainly eye catching. There are three pockets on the outside of this sturdy purse, including the conceal and carry "holster". On the inside there are several compartments to keep you organized. Tons of zippers make losing items almost impossible. The wide strap is adjustable and removable, so you can convert the purse into different styles for carrying. Measurements on this festive handbag are 10 inches by 4 inches by 10 inches, so there is lots of room for storage. Oh my! 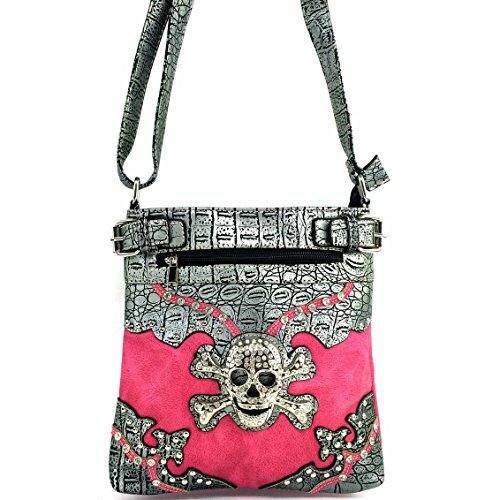 A hot pink skull purse with chrome colored accents has a conceal and carry pocket. If pink is your color, this is your item. This pleather artificial croc skin bling purse has all the features you would want in a cross body purse. Various zip compartments keep your stuff where you put it. This 11 inch by 11 inch by 2 inch concealed carry ladies purse is festooned with rhinestones. This would make a wonderful gift for a woman motorcyclist. If real leather handbags are your preference, here is an elegant red leather skull purse. The sugar skull is laser engraved onto the motorcycle handbag. This carry and conceal fashion item has three outside zippered pockets and inside one of these is the holster for your handgun. There is plenty of room for all your purse essentials in this cross body bag. The sturdy shoulder straps are clip on style, and they can be adjusted or removed. This genuine leather ladies biker purse measures 12.5 inches by 11 inches by 5 inches. Many of us motorcycle mavens appreciate an over the shoulder type of ladies concealed and carry purse or handbag. 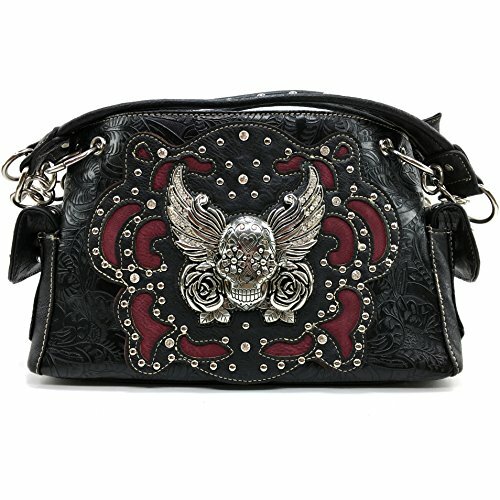 And if you are a biker chick who appreciates skulls on her accessories, these purses are sure to rev your motor! 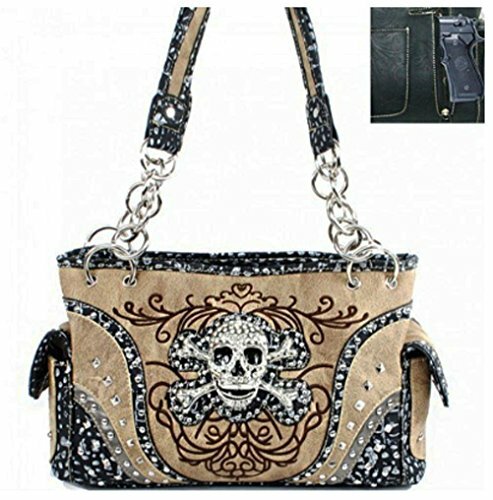 This earth toned bedazzled rhinestone purse is decked out with a sparkling skull and crossbones. It is a perfect meld of biker mystique and cool south western accents. There is a discreet pocket for carrying your firearm and all the other zippered pockets, nooks and crannies make packing your purse fun. Designed with synthetic leather and metallic trim this cool handbag measures in at 12 inch by 8 inch by 4 inches and has a 10 inch long, strong handle attached to the bag with large jewelry chain links. This embossed pleather black and red skull purse has been laser carved and adorned with rhinestones. The skull itself has wings and roses with rhinestone accents. The zippered gun carrier is on the back, along with another little pocket to put necessities in. The main compartment zips shut and there are 2 cute little side pockets. This delightful purse is easy on the eyes and will travel many miles with you on your motorcycle journeys. 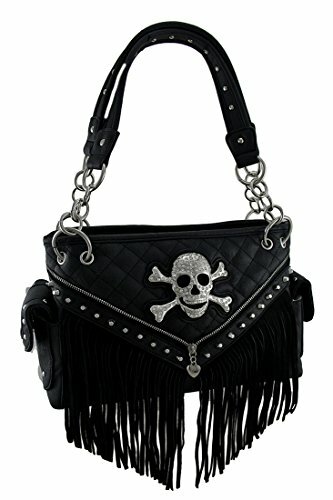 The skull purse measures 14 inches by 9 inches by 4.5 inches and shoulder strap is 11 inches long. Here's looking at you baby! This oh so bright sugar skull pistol packing purse is vibrant, colorful and delights the eyes. The multi colored embroidery creates the candy skull and flower motifs that decorate this skull hand bag. Lots of zippers and chrome stud embellished pockets make this a safe place to keep purse items. The easily accessible gun storage area is zippered. This is a good sized shoulder bag measures 14 inches by 9 inches by 6 inches. The studded handle will be comfortable to carry. A cool skull purse with fringe benefits. OK its a skull and crossbones purse with fringes. Any way you describe it, this is a badass biker babe kind of handbag. Quilted leather textured vinyl and faux suede fringe are the backdrop to a brilliant rhinestone covered skull on this ladies over the shoulder purse. There is an adorable zipper decoration accented by chrome studs and a sweet heart locket. The conceal and carry zippered pocket is on the back side of this 13 inch by 8.5 inch by 4.25 inch bag. The 10 inch long and 1.25 inch wide carry strap is garnished with studs. Bling, bling, bling. No, its not the phone. Its the most brilliant, rhinestone encrusted ladies conceal and carry purse that you could ever wish for, just calling your number. 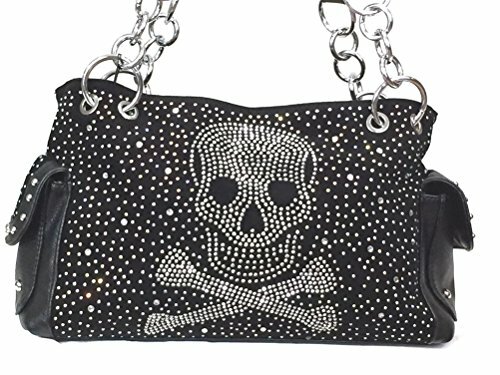 This skull and cross bones purse is so sparkly its almost blinding. 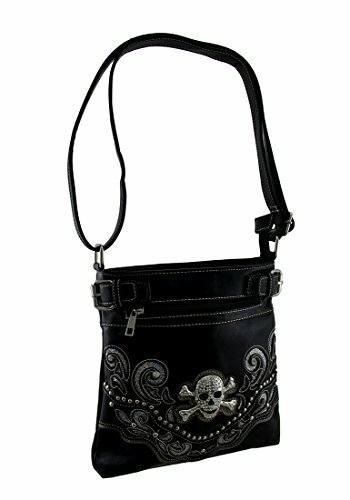 The side pockets snap closed, but all the other pockets and compartments in this sassy skull handbag are zippered. Gun transportation is easy with the handy carry pocket located on the outside on the back of this ladies motorcycle purse. The measurements on this bag are 12 inches by 8 inches by 4.5 inches. The double handle straps are 10 inches long. Are you feeling blue? Maybe this cheerful blue conceal and carry over the shoulder skull purse will make your day brighter? 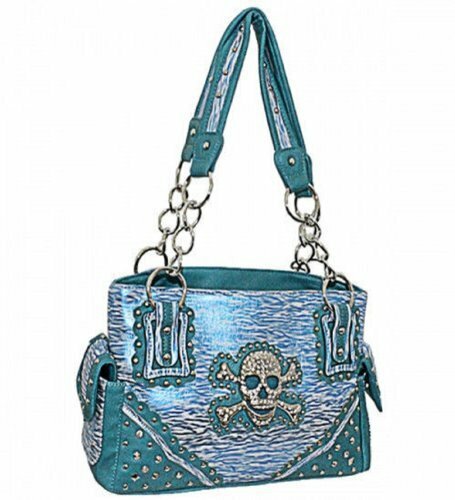 Ladies biker skull purses come in many colors and this two toned blue beauty is just one of the examples. Made out of faux leather, this pretty purse has a unique wavy baby blue background accented with stud designs. The skull and crossbones are enhanced with diamond like rhinestones. a vertical zipper closes the conceal and carry pouch, and all the other main pockets are zip shut too, except for the two side pockets that snap shut. This spacious womens motorcycle handbag measures 14 inches by 9 inches by 5 inches. Motorcycle backpacks are so practical. There is no end of things you can carry aside from your firearm. Combine practicality with skulls and enthusiasm abounds. Although skulls are the theme in this article, there are also many other beautiful motorcycle backpack purses for women. 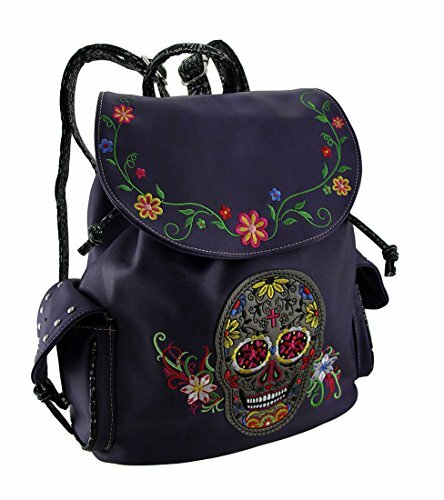 This sugar candy skull and floral embroidered ladies backpack is gorgeous. This bright and pretty conceal and carry backpack is made of artificial leather. The top flips over and stays shut with magnetic closures as well as a drawstring. There are zippered pockets on the inside too! Feel safe and secure with your hand gun securely stashed in the zippered carry pocket on the outside back of the pack. The backpack measures 12.5 inches by 10.5 inches by 6 inches and the 1 inch wide straps are adjustable. 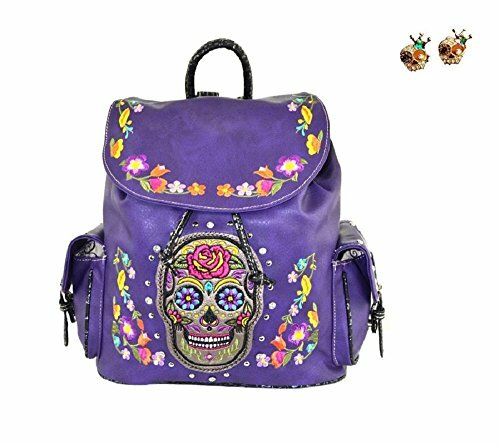 This pretty purple pistol packer of a biker backpack comes with adorable post style rhinestone skull earrings. What a deal! Colorful candy skulls and flowers are embroidered on the front of this purse. The zipped gun carrier pocket is on the back. There are 2 cute little side pockets too. This backpack style of a conceal and carry handbag closes with drawstrings and magnetic closure front flap. Measurements are 13.5 inches by 11.5 inches by 6.5 inches. Vegan leather purses are the new must have in this ecologically aware world. 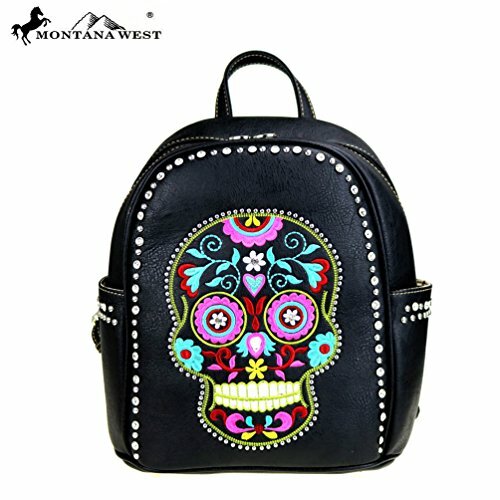 This black zip up beauty of a candy skull backpack purse has all the colorful embroidered beauty one would expect of a quality product. It is decorated with tasteful accents of rhinestone sparkle. This zipper closure skull backpack has a zippered inside pocket. The conceal and carry option is a zippered area on the back of the ladies motorbiking backpack. There are 2 open pouches on the outside of the handbag. Measuring 11.5 inches by 5.5 inches by 11 inches, there is plenty of storage area. The double straps are adjustable. Whats not to love about this ladies skull backpack purse. This grey drawstring tote conceal and carry skull purse has snap shut magnetic closures as well as a draw string to assist in keeping your purse contents secure. The concealed carry feature is on a zippered outer pocket on the back of this darling imitation leather handbag. Silver hard wear and an embroidered skull are the features that catch your eye on the face of this bag, along with the unique laced leather look. Two tiny little silver colored skulls can be found on the outside corners at the bottom. The size of this grey purse for women motorcycle lovers is 10.5 inches by 12.5 inches by 6 inches and has a choice of two detachable handles. Colorful and convertible is a great combination for a ladies motorbike purse. 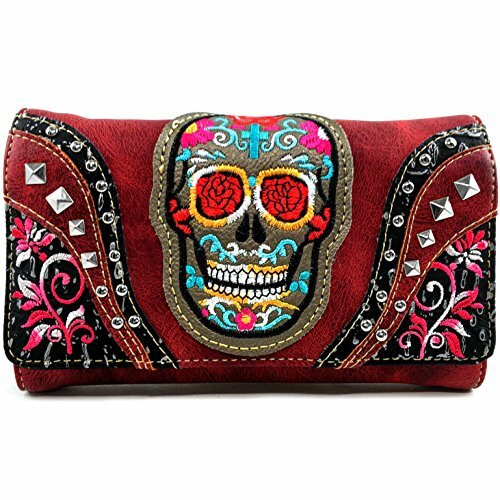 There are so many ways to wear this lovely wallet style embroidered sugar skull purse. The handbag can be used without a strap as a clutch purse, or with a wrist strap or you can use the over the shoulder strap. 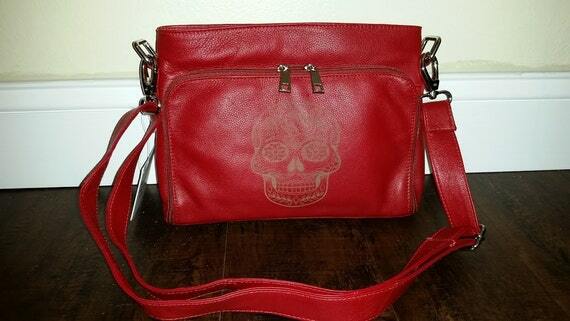 This model is a vibrant red conceal and carry skull purse, but it is also available in a plethora of other colors. This unique purse opens to many compartments for your cards, cash and keys. The carry feature is on the outside of the purse in a zippered compartment. This convertible ladies clutch style purse measures 13 inches by 8.5 inches by 4.5 inches. A pewter silver skull conceal and carry purse, and a matching wallet are an idea to celebrate! 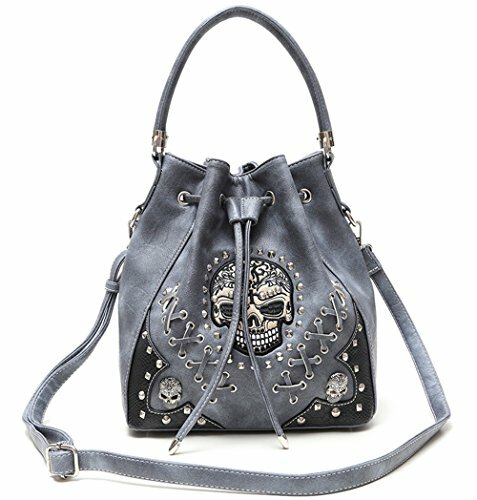 Skulls, skulls and more skulls decorate this synthetic artificial leather biker girl handbag. The matching wallet is a bonus to this practical duo. There is bling in the rhinestones of the skull emblem and dozens of little skulls are emblazoned on the pleather. The zippered gun pouch is on the back. Also, there are two little snap shut pockets and a cell pocket on the outside. There is lots of room inside the zipped main compartment. The purse size is 13 inches by 8 inches by 5.5 inches, and the wildly wicked wallet fits easily inside it. Thank you for exploring my ideas for Ladies conceal and carry skull purses and handbags for bikers. It was fun sharing these beautiful and practical items with you and I hope you found these ideas helpful.